Automated email notifications is a process to send email notification to teachers with important information involving Attendance. There are two email notifications sent to teachers, one is the weekly email to inform them of days they have not marked attendance and the second is a daily email to inform then of students who are absent form class consecutivey without reason. These emails can be manually triggered by the user as well. 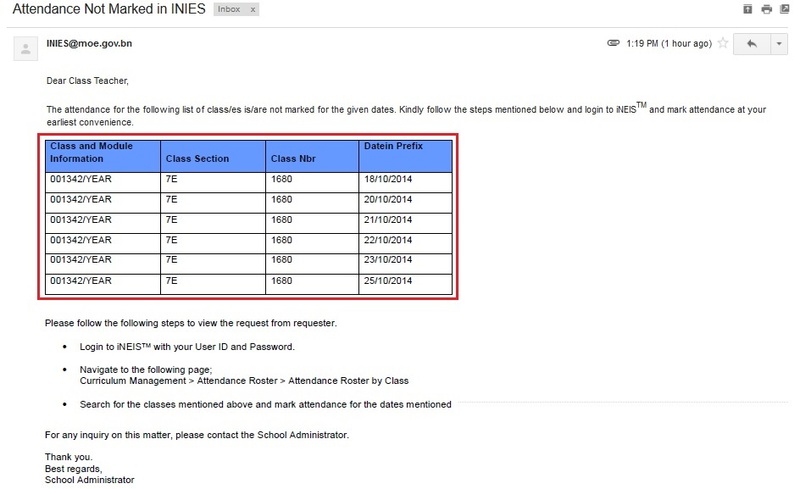 This function allows the user manually trigger the email to notify the teachers of the days they have not marked attendance within the current term. 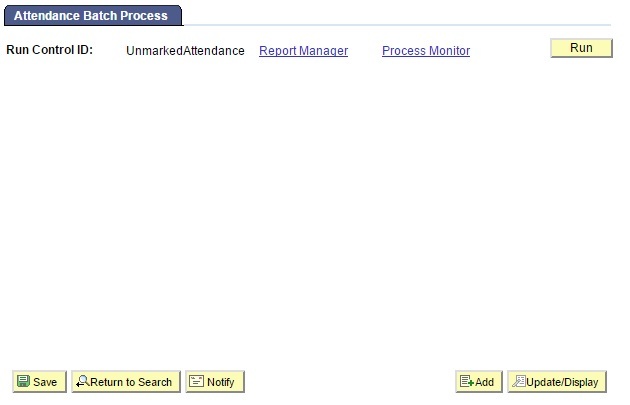 Navigate to Main Menu > Curriculum Management > Attendance Roster > Process > Attendance Batch Process. To run the process to send the email, click on the Add a New Value tab. Enter theRun Control ID to identify the process run to send out the email. Run Control ID is a unique ID assigned to identify the data entered to run the process to send out the email. The ID cannot contain any spaces, hyphens ‘-‘and underscores ‘_’ between words. User will be directed to the Process page. Click on the Run button to select the process to be run. 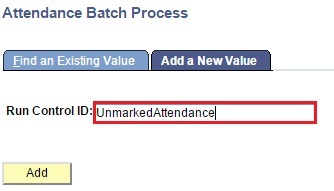 Select the Process Email for Unmarked Attendance. Click on the OK button to proceed with the transaction. Click on the Cancel button to terminate the transaction. Upon clicking on OK and the process has begun to run, a Process Instance number will be assigned. Click on the Process Monitor to check the status of the process. User will be directed to the Process Monitor page. 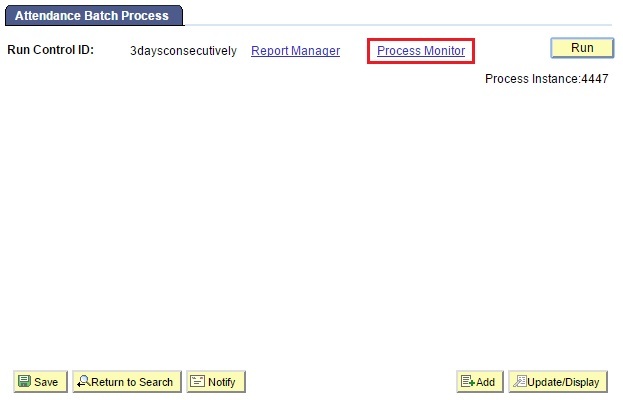 Monitor the process against the Process Instance number and initially the Run Status and Distribution Status are ‘Queued’ and ‘N/A’. Click on /Refresh button to view the refreshed Run Status. Continue to click until Run Status changes to ‘Success’ and Distribution Status goes to ‘Posted’. 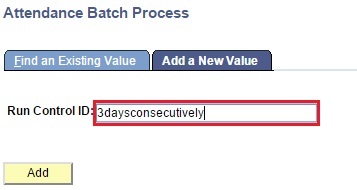 Once Run Status changes to ‘Success’ and Distribution Status goes to ‘Posted’, click the Go back to Attendance Batch Process link. The list of the classes and the dates for which the Teachers did not mark attendance will be listed in the email notification sent to all the teachers. This function allows the user to manually trigger the email to notify the teachers for the Students who are absent consecutively for 3 or more days without a reason. Enter the Run Control ID to identify the process run to send out the email. Select the process Attendance Batch Email to CL. To select the process to be run and the process has begun to run, a Process Instance number will be assigned. Click on Refresh button to view the refreshed Run Status. Continue to click until Run Status changes to ‘Success’ and Distribution Status goes to ‘Posted’. 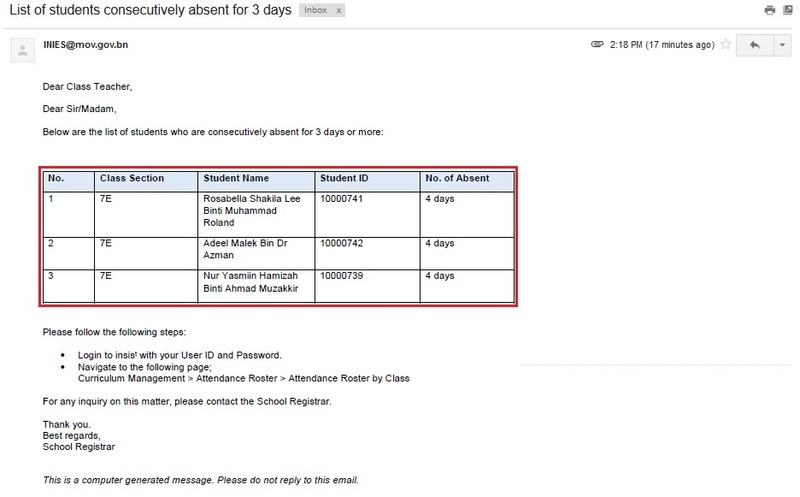 The list of the students and the number of days the students were absent for will be listed in the email notification sent to the Class Teachers.